During a major conflagration, fire protection agencies may not have enough equipment and manpower to be at every home. If a house is already in flames, firefighters may have to pass it by to save others in the fire's path. Law enforcement or fire officials may advise you to evacuate. If you are not notified in time, or decide to stay with your home, the following suggestions will help you defend your property. Evacuate pets and all family members not essential to protecting the home. But don't risk your own life. Dress in natural fibers, not synthetics. Wear long pants and boots. Remove combustible items from around the house. Close outside attic, eave and basement vents, and shutters. Place large plastic trash cans or buckets around the outside of the house and fill them with water. Soak burlap sacks, rugs, and rags to beat out burning embers or small fires. Inside, fill bathtubs and storage containers with water. Locate garden hoses so they will reach any exterior surface of the house. Use a spray gun type of nozzle. Use a portable gasoline-powered pump to take water from a swimming pool or tank. Place a ladder against the roof of the house opposite the side of the advancing fire. Soak the roof. Back cars into the garage and roll up the windows. Disconnect the door opener. Close all garage doors. Place valuable papers and mementos inside a car in the garage in case a quick departure is necessary. IF YOU ARE CAUGHT IN THE OPEN: The best temporary shelter is in a sparse fuel area. When in an automobile, move it to the barest possible ground. Close all windows and doors. Lie on the floor and cover yourself with a jacket or blanket. Keep calm and let the fire pass. If a road is nearby, lie face down along the road cut or the ditch on the uphill side. Cover yourself with anything that will shield you from the fire's heat. When hiking in the back country, seek a depression with sparse fuel. Clear fuel from the area while the fire is approaching and then lie face down in the depression and cover yourself. On a steep mountaintop, the back side is safer. Canyons: They form natural chimneys and concentrate heat, gases, and updrafts. Saddles: Vegetation normally ignites first in these wide, natural paths that are ideal for fire storms and winds. 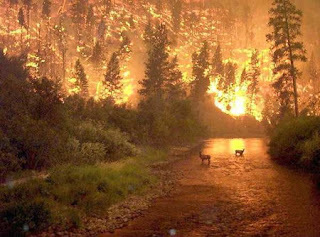 Fire plays a natural role in the ecology of forests and rangelands. Homes located on the fringes of these areas are in danger of wildfire. Reduce the risk of fire destruction, take steps to landscape the grounds properly and fireproof all buildings. Contact the local fire protection agency for home safety guidelines and information on brush and tree clearance. Before hiking in the back country, consult the public or private agency that manages the area for tips on fire survival.